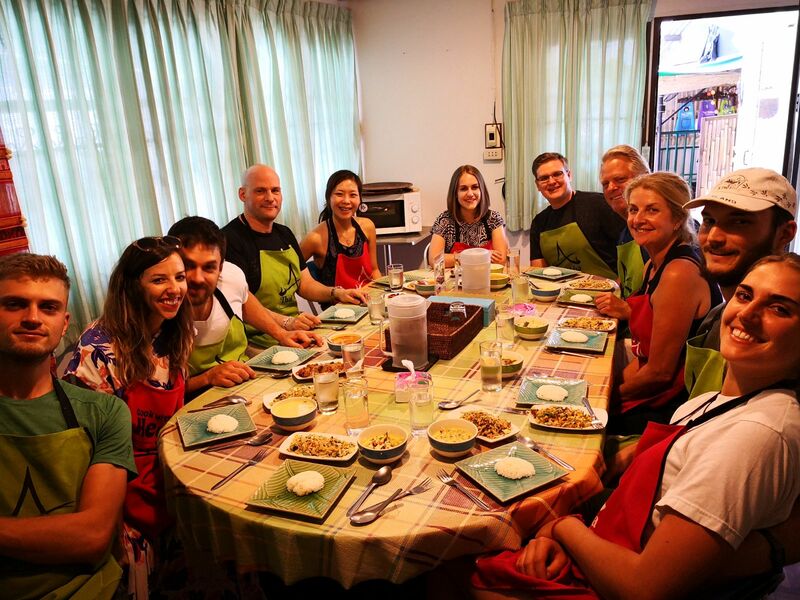 This David Papkin post about Chiang Mai Thai Akha Cooking Class. 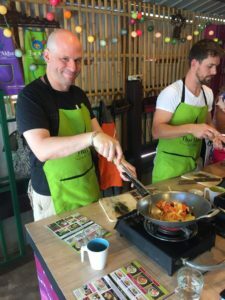 I went for a cooking class at an authentic Thai Akha cooking class in Chiang Mai, Thailand. 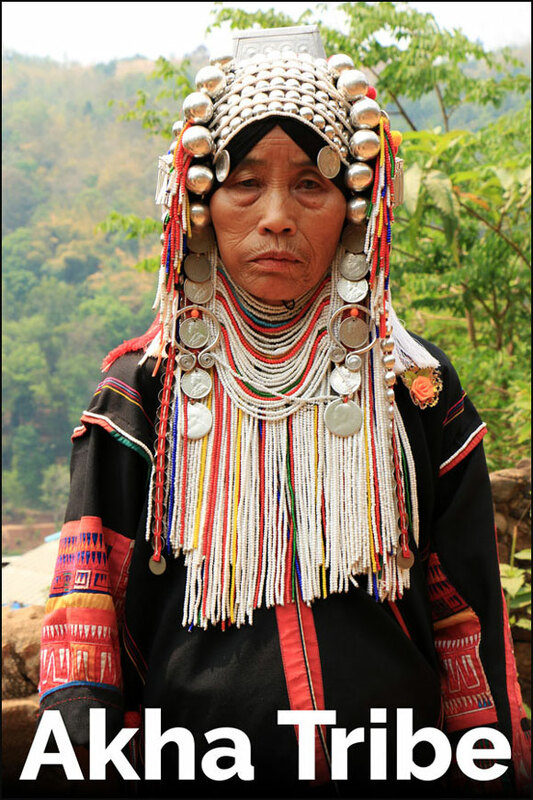 The “Akha” people immigrated and became citizens of Thailand in the early 1900’s through China, Laos and Myanmar. There are now 80,000 Akha people living in small villages in the mountains of Thailand. 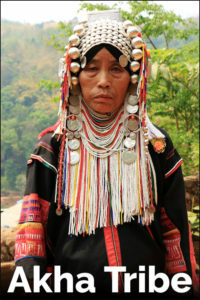 Akha people have their own traditions, culture and beliefs, different from the rest of Thailand, as many hill tribes do. 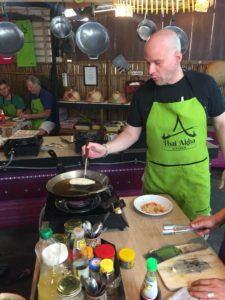 Thai Akha Kitchen is run by Akha people who were born and raised in Thailand. 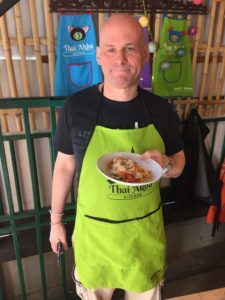 They love Thai food just as much as you! 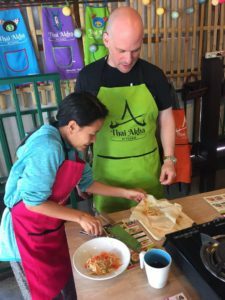 This cooking class taught me how to cook 11 Thai dishes from scratch. First I made is papaya salad and then spring roll. To make the spring roll , first you heat oil , add garlic, then tofu, bean sprout, carrot and glass noodle. After the ingredients cook, you let cool for 15 minutes, then put in the skin, ans roll propery. 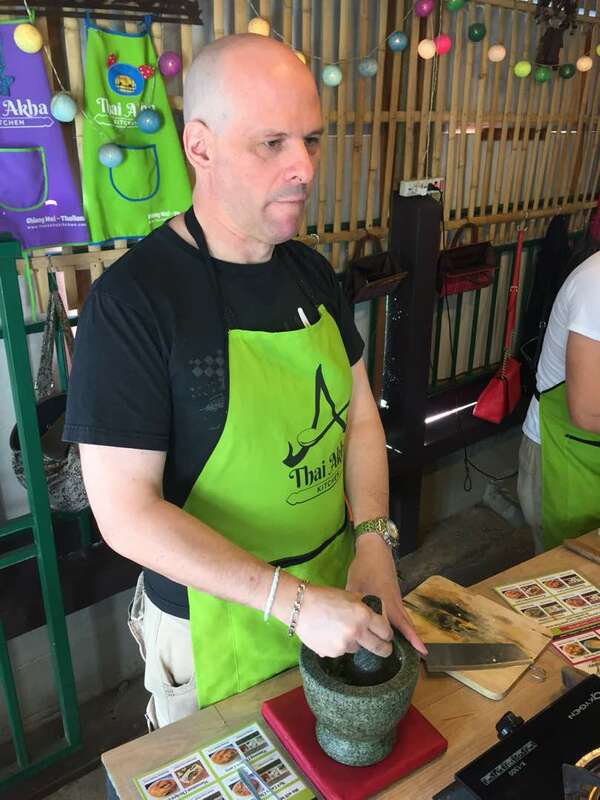 Instructor is inspecting my springroll. Then you cook the spring roll 3 long seconds on each side. Somtum Papaya Salad has lime juice, shrimp paste, palm sugar, finely chopped chilli, long bean, garlic, tomato, grinded in wooden bowl and mixed thoroughly with papaya and carrot and optionally added roasted peanuts if you not allergic!!! 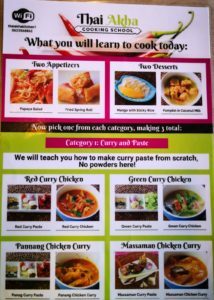 Next I made Thai Green Curry. 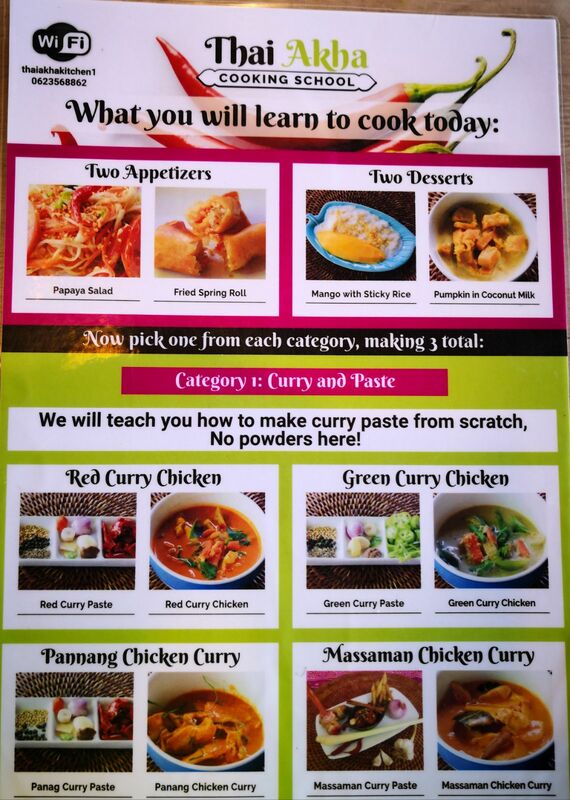 The difference between red curry and green curry is the color of the chillis actually!!! 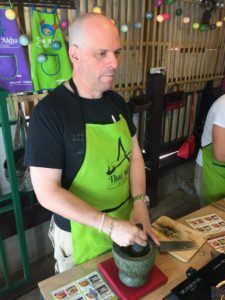 I ground in a stone bowl a variety of 10+ spices such as garlic, shallots, shrimp paste, salt and finely chopped green chillis. 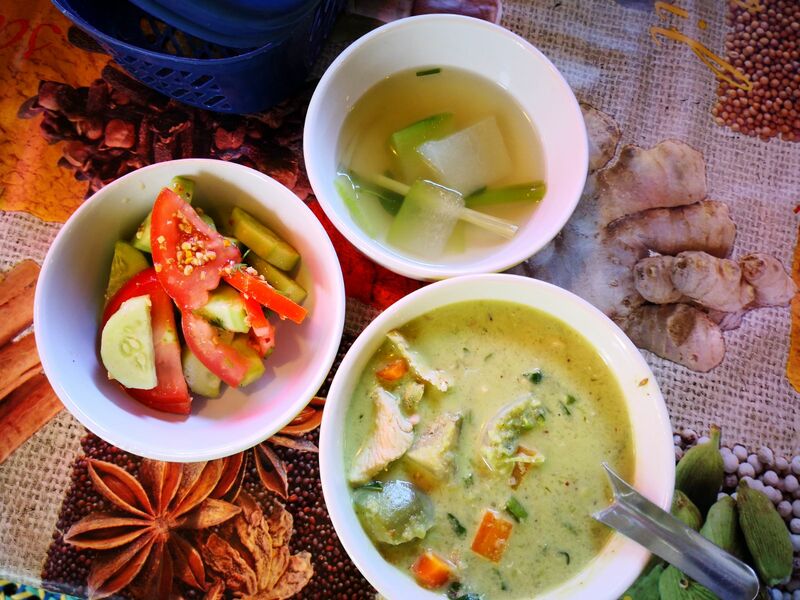 I boiled coconut cream ad then added the green curry paste, mixed it, then coconut milk ,and chicken pieces. Then added eggplant pieces and soy sauce and salt as needed. The other 2 dishes are Akha salad and clear soup. I then made sweet and sour chicken. Quite easy actually. 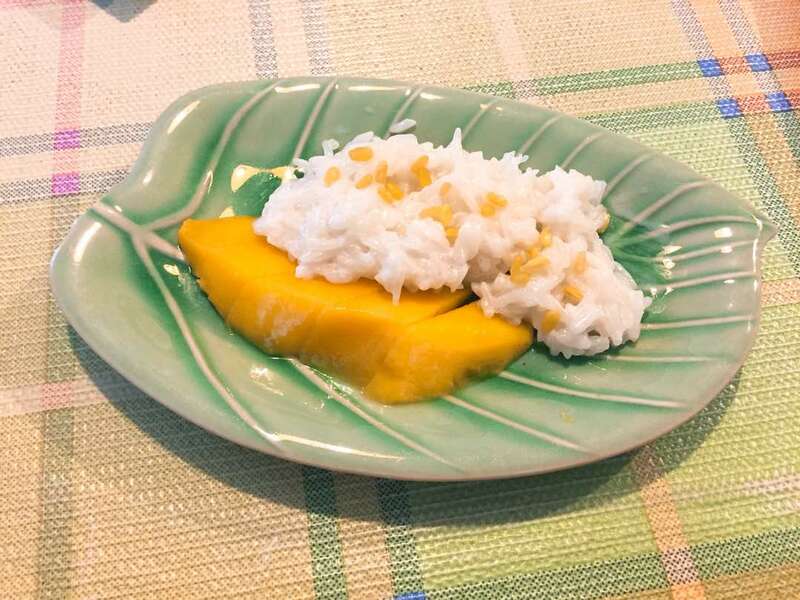 For dessert, had sticky rice with mango in coconut milk. The other participants were very friendly and we tried each others dishes. This concludes David Papkin post about Chiang Mai Thai Akha Cooking Class.